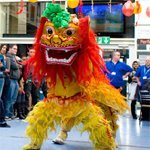 Happy #ChineseNewYear from everyone at the University of East London! Can you please say a huge Thanks to Tugs and his friend, they did a brilliant job. Children and teachers enjoyed it. Can you please tell me how much I owe you and the bank account? i will transfer money to you this evening. Thanks for your email, the event went really well thank you. Hui Ling Lee was amazing and really flexible with her approach and superbly welcoming and warm to our guests. We couldn’t be happier. Please convey our thanks to her. We shall make a transfer of payment for the invoice and we look forward to working with you again. Hi Titus, thanks for following up. The day went very well and Jia did a fantastic job. In the end, people were more focused on having him write out their names than trying out the writing themselves but Jia was very patient and professional about it all. Payment is being processed and I will keep an eye on this until you receive it. The guys were great last night please say thank you to them. I will send over some of the images once I receive them. I just wanted to say how much we all enjoyed the lion dance this morning, all three of your performers were very helpful and accommodating and gave us a very entertaining performance. The children were particularly excited about today and your dancers did not disappoint. Thank you again.